From Barack Obama (Harvard and Chicago) to Bill and Hillary Clinton (Yale), many of our current national leaders emerged from the rarefied air of the nation’s top law schools. The ideas taught there in one generation often shape national policy in the next. 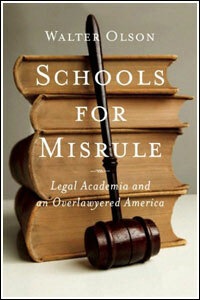 The trouble is our elite law schools keep churning out ideas that are catastrophically bad for America. From class action lawsuits that promote the right to sue anyone over anything to court orders mandating the mass release of prison inmates; from the movement for slavery reparations to court takeovers of school funding–all of these appalling ideas were hatched in legal academia. And the worst is yet to come. A fast-rising movement in law schools demands that sovereignty over U.S. legal disputes be handed over to international law and transnational courts. It is not by coincidence, Olson argues, that these bad ideas all tend to confer more power on the law schools’ own graduates. In the overlawyered society that results, they are the ones who become the real rulers.